If you want a mid-priced workhorse that can handle your day-to-day calls, then the Voyager Legend should fit the bill—but don’t expect it to really wow you. The Plantronics Voyager Legend is a middle-of-the-road option that's a solid option for average users. 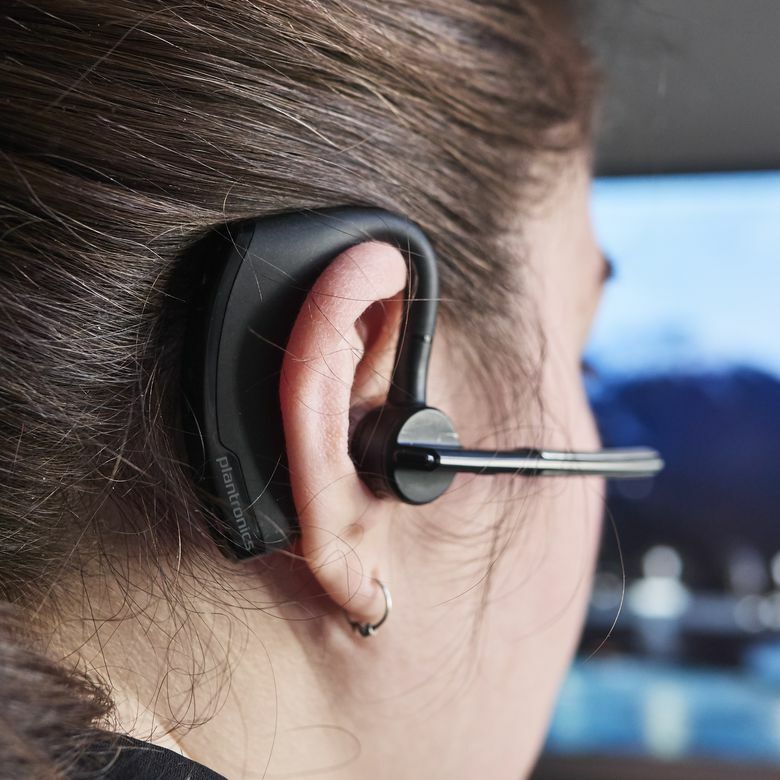 When Plantronics developed this Bluetooth headset, they did so with convenience and connectivity in mind, folding in some interesting sensor functionality, a degree of moisture-resistance, and even voice assistance integration. The fit in a user’s ear and the sound quality inherent with that loose fit do leave a bit to be desired, so don’t look to these if you intend to place calls in excessively noisy settings. But if you want a moderately priced Bluetooth headset with tons of convenience and solid voice clarity, then this could be a great option. The look of most of Plantronics more “active” Bluetooth headsets is largely the same: a grill-adorned boom mic coming from a cylindrical driver housing, a clear silicone eartip, and a bulky behind-the-ear housing that contains most of the inner workings, including the battery. This design is somewhat intentional, as it puts a lot of the components behind your ear, and ostensibly out of sight, but that fact does have some ramifications when it comes to comfort (we’ll get to that in a second). The boom mic itself measures just under 3 inches from the ear piece, and that bulky behind-the-ear component is about 2-inches long and .5-inches thick. The boom does swivel to fold up alongside the over-ear component, leaving a smaller footprint both when storing and wearing the headset. And with a mostly black design and a silver, perforated grill along the boom, this is actually our favorite Plantronics design (the more expensive 5200 has red accents that aren’t exactly subtle). One of the biggest negatives for the Voyager Legend is the stability of fit. That’s odd, because Plantronics was clearly going for a bit of a sporty design with this headset, which implies that it would be a very firm fit with a good amount of comfort, but because of some design choices, that isn’t the case. First, a point on the eartip—what should be the tightest, most ergonomic part, is actually a little awkward. The eartip is made of clear silicone, but it’s a little bit more rigid than the silicone you typically find in sporty earbuds. As such, it doesn’t mold to your ear canal as well, and also doesn’t create the firmest seal. Impressive connectivity and sensor functionality, alongside really crisp call clarity. The standard set is about .5-inches in diameter, and Plantronics does include two other silicone tips in the box (one set is slightly bigger, and the other slightly smaller). While most earbuds reward you for finding the right size, it’s almost imperative with the Voyager Legend that you find your ideal fit. We also found it more comfortable to wrap the silicone tips in the included foam black coverings, even though we anticipate this material wearing down over time. The other awkward part of the fit here is the behind-the-ear section. As mentioned, it seems like a bulk of the battery and connectivity components are inside this arm. It’s quite thick and bulky as a result, which is fine from a looks perspective when it’s tucked behind your ear, but we found that this added some uncomfortable weight pulling backwards, which exacerbated the loose fit. Overall, if you can get used to the earpiece floating in your ear, rather than resting nicely, then this will probably work for you, but we think Plantronics could have done a bit better. As far as Bluetooth headsets go, the construction here is mostly solid. The whole unit is encased in a soft, matte rubber surfacing, which makes it both pleasant on the ear and also flexible. This softness works in its favor, as it isn’t rigid enough to snap. There is one swiveling rigid part—the boom mic—and though we do recommend being careful when storing and pivoting it, it feels pretty substantial. There isn’t an advertised IP rating for these, meaning we can’t offer you any definitive levels of water or dust resistance, but Plantronics does state that there’s a P2i nano coating that allows the headset to resist moisture and sweat. This headset will cover you for most of your needs, even if you move and sweat a lot, but we don’t recommend using these in heavy downpour, or submerging them in water. The sound quality on these was serviceable, providing a great level of detail without any substantial amount of low end. We spent a few days with this headset, testing its call capabilities between our offices spaces, on the street, and in our home. The sound quality on these was serviceable, providing a great level of detail without any substantial amount of low end. This lack of low end could have largely been due to the lack of seal in our ear, but if you’re hoping to listen to any music on these, then you won’t be super impressed. Where the headset really shines is in the microphone quality. There’s a three-mic array that aims to pick up sound and cancel noise from a variety of angles. There’s internal DSP that suppresses noise coming through the mic to ensure a good level of crispness when you’re speaking, and paired with a 20-band equalizer that adapts to the environment, the voice quality is impressive. They’ve even included something called “side tone detection” that aims to pinpoint and suppress acoustic reverberations in your space. They’ve also built a mesh wind-guarding net underneath the microphone grill that actually serves as a windscreen, helping to reduce wind clipping. In our tests, the microphone really did shine on this device, even in particularly echo-y rooms. Plantronics puts the battery life at about 7 hours of talk time and 11 days of standby time. We can say that the talk time is right about 7 hours (perhaps a little shy if you use this headset in a noisy area, requiring a lot of reduction), and our useage did trend toward 11 days of standby. This is largely affected by your personal use, but we can say subjectively that the battery life was impressive and true to the claims on the box. The interesting sensor technology and the steadfast connectivity in most of our tests serve as key selling points for this headset. What’s more, is that it takes about 90 minutes for a full charge. There’s no quick charging function here, but that 90 minutes to a full charge is pretty impressive, even for higher dollar options. One important note is that the lithium ion battery here recharges with an included proprietary charger that locks in via a magnet. It makes it really easy to just plop the headset into the charger as it sits on your desk (it’s like a mini dock), but because this headset doesn’t use the more universal micro USB, you’ll need to make sure you have the included charger wherever you’re on the go. It’s a lack of convenience that definitely sets this headset back a bit. The interesting sensor technology and the steadfast connectivity in most of our tests serve as key selling points for this headset. There are dual capacitive sensors around the ear that actually detect whether the headset is on your ear or off. This folds into the connectivity, because this actually tells your phone whether an incoming call should be routed to your headset or to the phone, without pressing any buttons. You can have this headset connected to two phones at once, and you can answer calls from either phone—in our experience, this handoff was pretty seamless. There’s a really pronounced on/off toggle switch, as well as a slider-based volume control, and a function button that is mappable with the associated app. There’s Bluetooth 3.0 on-board, including A2DP, AVRCP, HFP, and HSP headset protocols, which means that you’ll get about 33 feet of range and plenty of compatibility with most phones. It’s a really nice package that works pretty well, though it is important to note that we ran into some slight Bluetooth interference on our first pairing. This was handily fixed when repairing fortunately. The MSRP on the Voyager Legend headset is $99.99, which is pretty high compared with its functionality. Most of the time, you can find this headset for right around $60. This might seem like a lot for a simple phone call peripheral, but it’s actually less than many of the other premium options out there. This price point buys you impressive connectivity and sensor functionality, alongside really crisp call clarity. If you’re in the market for a Bluetooth headset, this one will last you a while. Plantronics Voyager 5200: Similar in design, but more expensive than the Voyager Legend, the Plantronics Voyager 5200 gives you just a bit more in terms of premium features. If you need cleaner calls and a sturdier build, go for the 5200. Jabra Stealth: There are a few Jabra options that could be considered competition, but in this price range with this compact build, the Jabra Stealth seems to offer an interestingly unassuming alternative. That’s if you want to shell out the extra money. Sony MBH22 Mono Headset: From a brand like Sony, you’d expect solid reliability. But the features on the Sony MBH22 Mono Headset leave a bit to be desired. If you prefer Sony as a brand, go for it, but features put the Voyager Legend in a better class. Take a peek at some of the other best Bluetooth headsets you can buy. Solid performance for a mid-range price, but the fit isn't the best. The Voyager Legend is a really solid Bluetooth headset that sits at a nice price point and gives you great call clarity. That said, there is plenty to be improved upon when it comes to the fit and comfort level. Product Dimensions 1 x 1 x 1 in.